This captivating road trip will bring you through many of the highlights along the south-east coast of Australia, and includes one of the world’s most scenic drives, the Great Ocean Road. You’ll take in some of the country’s most magnificent coastal scenery as well as several exciting cities, including Sydney, Melbourne and Adelaide. Along the way, there will be plenty of opportunities for outdoor adventure and wildlife encounters too. Begin your adventure by touching down in Australia’s largest city: Sydney. You’ll want to spend some time here before heading down the coast, perhaps taking a ferry ride to get a feel for the city’s layout and the opportunity to capture iconic landmarks like the Sydney Opera House. Speaking of which, you might want to take a tour of the opera house or catch a live performance. Other highlights include the Sydney Harbour Bridge which offers magnificent panoramic views of the city and a heart-pounding climb that’s truly a once-in-a-lifetime kind of experience. Be sure to check out some of the local markets too, like Paddy’s, set up between Haymarket and Flemington. There are hundreds of stalls here selling a variety of souvenirs and more unique items along with a wide range of fresh and artisan foods. 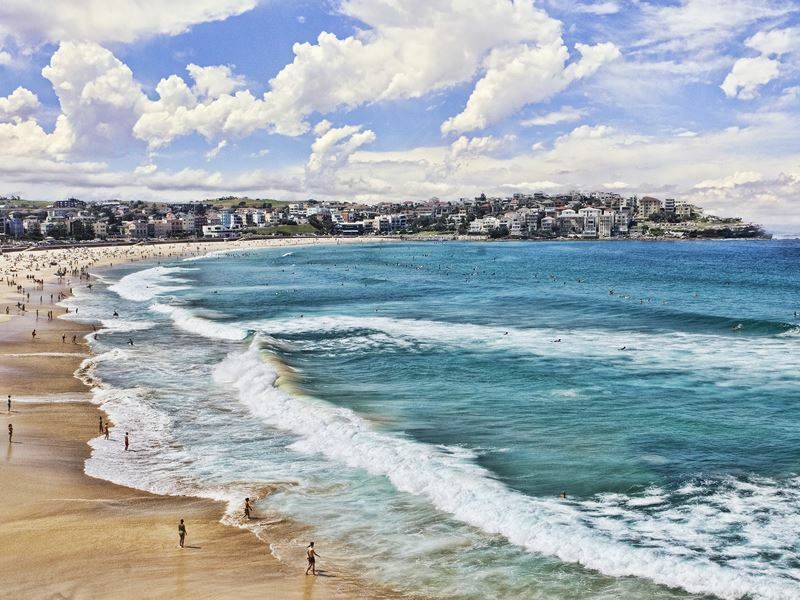 If you want to stretch your legs before getting in the car, you might want to do the Bondi to Coogee coastal walk which spans for about six kilometres offering beautiful views of the beaches, bays, cliffs, parks and rock pools. There are plenty of cafes and eateries along the way when you need to take a break and rest too. You’ve probably at least glimpsed the pristine white sandy beaches the Whitsunday Islands are so famous for online or in photographs, but if you don’t have time to add the archipelago onto this itinerary, we have some good news: Jervis Bay offers a similar experience and it’s only about a three-hour drive south of Sydney. In fact, the Guinness Book of World Records says it’s even better, noting the area beaches for having the whitest sands on the planet. They’re framed by strikingly clear turquoise waters that are especially enticing for a swim or snorkel. Along the way, you’ll pass through Royal National Park which features forested paths and quite a few beautiful beaches of its own. At Sea Cliff Bridge you might want to take the Bridgewalk where you’ll be able to peek deep into the clear waters to the bottom to see all types of marine life, huge massive manta rays. Beach-hop your way to Wollongong and Kiama, surrounded by stunning beauty, and perhaps take a short detour to the lush Minnamurra Rainforest with its tranquil streams and cascading waterfalls. There are a variety of walks like the rainforest loop walk that crosses a suspension bridge and provides access to Minnamurra Falls. 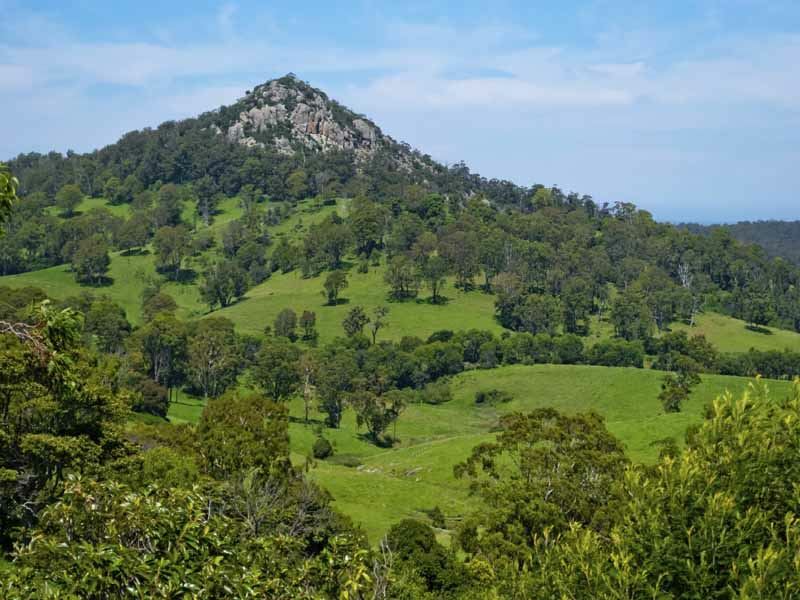 Enjoy the views on both sides of the road as you travel toward Tilba Tilba along the coast. Most of the way you’ll have breath-taking vistas of the coastline to the east and the stunning national park to the west. 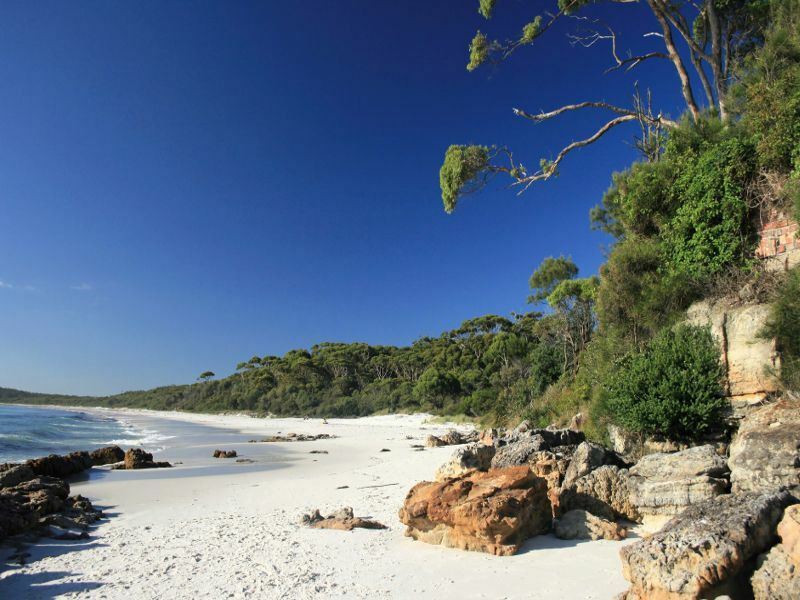 You might want to pick up some items for a picnic to enjoy at Bateman’s Bay which makes a great stop with its gorgeous beaches and abundant wildlife. As you travel further south, you’ll pass a number of coastal towns before reaching the heritage-listed villages of Central Tilba and Tilba Tilba. Once there, Tilba Valley Winery just north of Central Tilba is well-worth of visit. It boasts an especially picturesque setting next to Corunna Lake for sipping Rieslings, chardonnays and cab savs that have been produced here for 40 years. On Sunday afternoons you can often enjoy live music too. Travelling the Princes Highway, you’ll pass through scenic forest and charming villages on your way to the town of Merimbula on the gorgeous Sapphire Coast with its vibrant green hills sparkling lakes, caves, golden beaches and national parks. Continue to Eden, considered one of the top whale-watching destinations in Australia. Learn about the country’s early whaling history at the Killer Whale Museum and then, if you’re here between September and November, embark on a whale watching excursion. Otherwise, you might want to follow the Light to Light Walk which traverses from Boyds Tower in the south of Ben Boyd National Park to its northern end at Green Cape Lightstation. Continuing south, you’ll pass Conn River and Orbost along the banks of the Snowy River. If you’re looking for an action-packed adventure, spend some time in Snowy River National Park which features impressive gorges, waterfalls, forest and lush river scenery. It’s also popular for rafting with trips that will take you paddling through calm lagoons, rugged gorges and fast-moving rapids. Overnight at Lakes Entrance, home to the largest inland network of waterways in Australia. 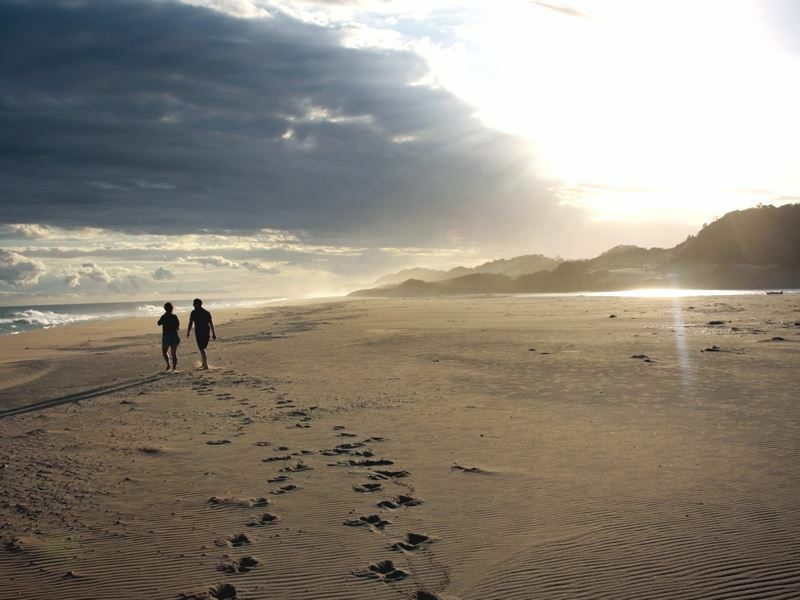 It’s home to glistening lakes that can be explored by paddleboat, kayak or a cruise, and by crossing the footbridge to Ninety Mile Beach you can enjoy swimming or surfing just offshore. As a seafood capital, you won’t want to miss the chance to sample a meal featuring the fresh catch of the day. Make your way west to Australia’s second most populous city after Sydney. You’ll travel through the pretty village of Metung on Gippsland Lakes, while nearby Raymond Island offers the chance to marvel at adorable koala bears and other wildlife. It’s a top spot for koala watching, with the animals introduced here in the 1950's. Melbourne, the capital of the state of Victoria, is a little over four hours from here. It’s widely regarded as the country’s cultural hub, a mecca for shopping and dining, with a diverse range of restaurants along with a host of art galleries, theatres and museums. Streets are lined with Victorian buildings sandwiched between soaring skyscrapers, while urban parks meet up with the coast. You’ll notice a distinctly European feel as you stroll this lively city, exploring the thriving marketplaces like Queen Victoria Market. Around for over a century now, it sells a wide range of crafts, produce, fashions and more. Shopping enthusiasts may want to browse or buy at the elegant Royal Arcade, along Chapel Street and at the Melbourne Central Shopping Centre. 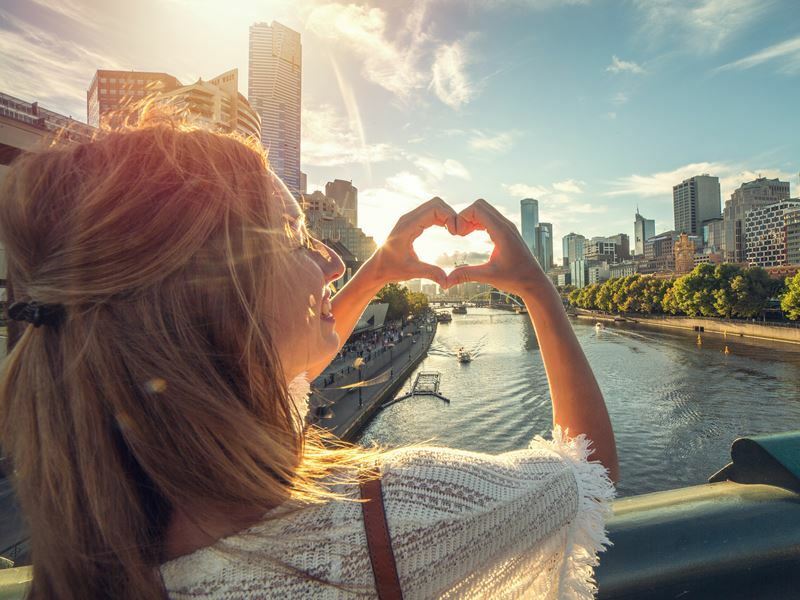 Be sure to sample some of the street foods along the way – Melbourne is often ranked among the world’s best with its abundance of fancy food trucks and wide variety of Eurasian street fare. As Melbourne fades away, you’ll continuing travelling west toward Apollo Bay. The seaside town of Torquay is just over an hour’s drive in and boasts some of Australia’s most famous surfing beaches. It also marks the official start of the Great Ocean Road. One of the world’s most scenic drives, it follows a 150-mile stretch to Allansford, with jaw-dropping views of the Pacific Ocean and dramatic cliffs as it winds its way through cool climate rainforest. Stop at Anglesea and take the detour to the golf course that’s famous for the many kangaroos that like to lounge underneath the shady trees that surround the greens. You’ll have another opportunity for a koala encounter at Kennett River. The Kennett River Koala Walk is famous for its wild koalas on a secluded stretch along the Great Ocean Road. 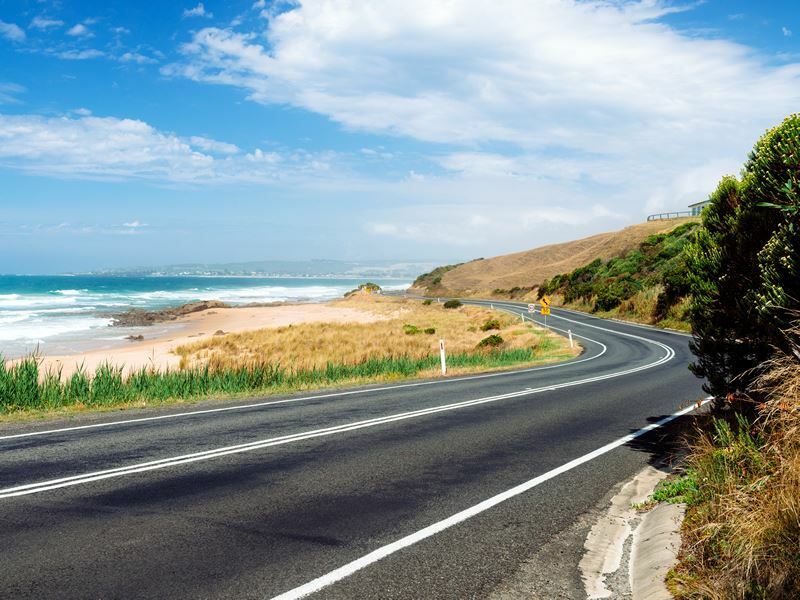 The drive between Lorne and Apollo Bay is often noted as the most stunning of all. Stop in Lorne to marvel at Erskine Falls which tumbles 30 metres into a lush tree-fern gully. Feel the mist from the cascades while taking in the beautiful view from the upper lookout, just a 5-minute walk from the car park. As you continue from here, it’s a feast for the eyes with the waves crashing onto beaches that sit below sheer cliffs. 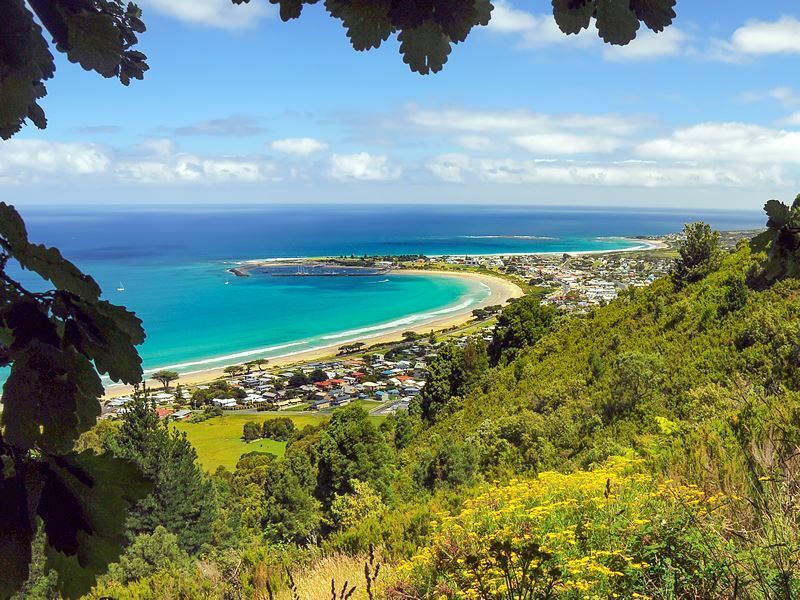 Just minutes from Apollo Bay is Great Otway National Park, home to sandy beaches, rugged coastline, rock platforms and colourful spring wildflowers. Travel through its lush rainforest where you’ll have the opportunity for a unique experience by turning off to the Otway Fly Tree Top Walk. This treetop canopy walkway is the world’s tallest and longest. For an even bigger adrenaline rush, take the zip-line tour. 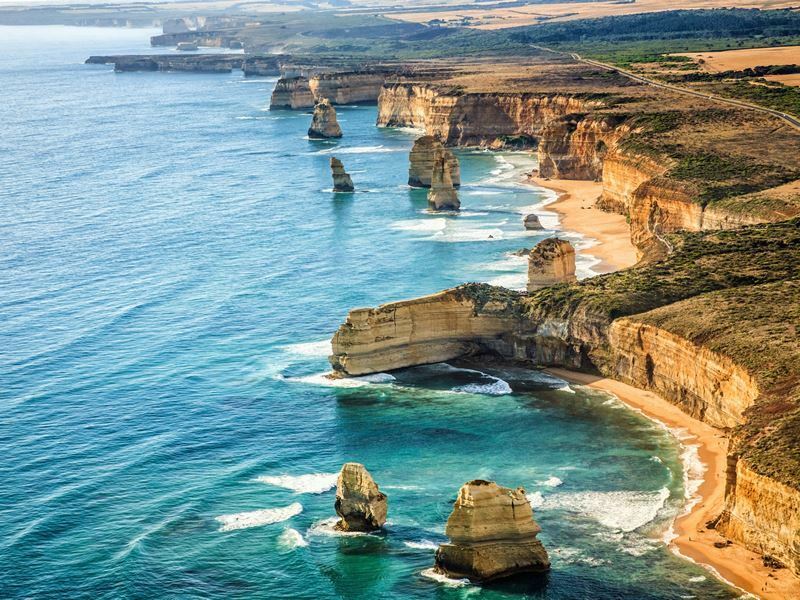 Continuing your journey on the Great Ocean Road, you’ll come to world-famous Port Campbell National Park, renowned for its wind- and wave-sculpted rock formations like the 12 Apostles, London Bridge and the Arch. If you want to spend some time soaking up the scenery, take a boat tour for a view of the remarkable limestone stacks from the water before driving on to Warrnabool for the night, which offers scenic coastal views, gardens, art galleries and multiple restaurants. 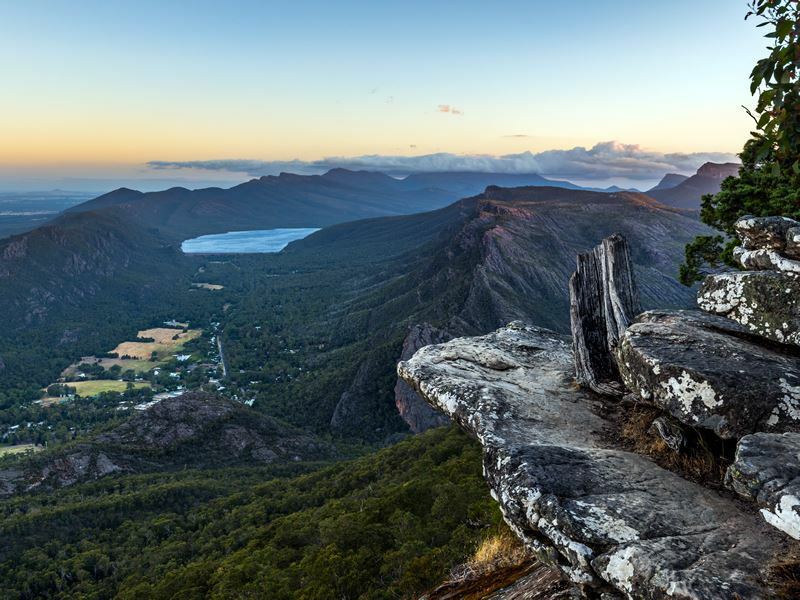 Travelling toward Halls Gap, you’ll enjoy another one of the most scenic routes on this itinerary through Grampians National Park, with majestic mountains and forest that rise out of flat farmland. Take in sweeping vistas from the Boroka, Reed and Mountain William lookouts and view the rock art and red ochre handprints at the Ngamadjidj Shelter in the Northern Grampians as you delve into the area’s rich Aboriginal history. Spend the night in the village of Halls Gap near the park’s entrance and enjoy the next day exploring more of the park, perhaps hiking the trails to waterfalls like Silverband and MacKenzie Falls while watching for wildlife like wallabies and echidnas along the way. Continue to Mt. Gambier which is surrounded with pristine freshwater lakes and deep caves that are the result of ancient volcanic activity. The city was built among the craters, caves and lakes right along the slopes of an extinct volcano. 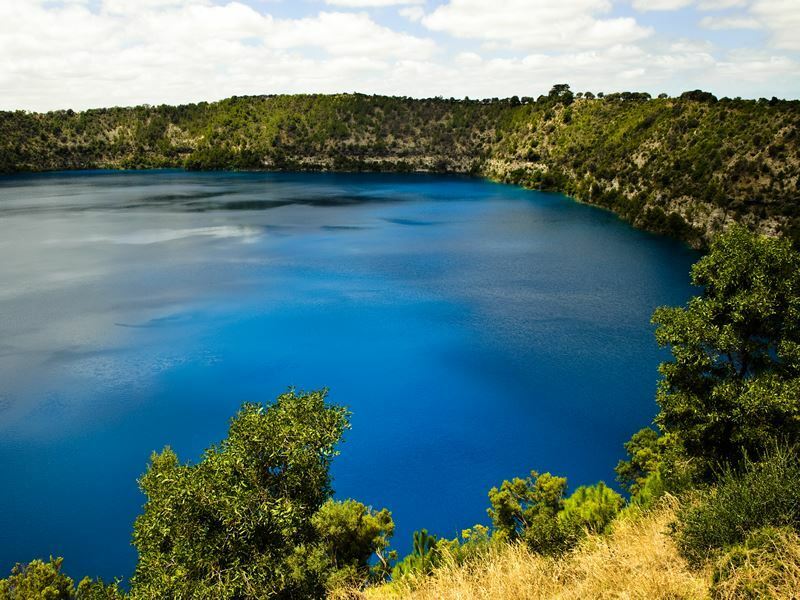 The Blue Lake is the largest of the three volcanic craters, and if you’re here in November you’ll see the water turn to an ethereal turquoise shade. Located in a region referred to as the Limestone Coast, the area naturally has features associated with limestone 0 not only caves but sinkholes. Right on the outskirts of town is an especially impressive sinkhole known as the Sunken Garden, or the Umpherston Sinkhole. It’s overgrown with a garden that makes it look as if it’s sunken into the earth. Adventurers may want to do some spelunking at Engelbrecht Cave before embarking on the final leg of the journey to Adelaide. The stretch of road from Mt Gambier to Adelaide is known as the Limestone Loop and is an especially spectacular driving experience. Be sure to stop at the famous Naracoorte Caves and Coonawarra, known for producing Cabernet Sauvignon wines with grapes grown on "terra rossa" soil. If you travel inland, you can visit infamous Bordertown to explore the interesting Bob Hawke Museum and encounter the huge mob of white kangaroos that inhabit the area. Otherwise, follow the coast, exploring the port towns of Robe and Kingston before journeying through Coorong National Park’s sandy landscapes. Adelaide sits on a plain tucked between rolling hills and the Gulf St. Vincent. It’s the ideal place to stay before experiencing another highlight of the trip: a flight to Kangaroo Island. In the meantime, you can enjoy the city’s 150-year-old Central Market with over 80 stalls, restaurants and cafes, or explore the more than 100 pubs, trendy bars and watering holes that await outside the market, along with fine dining restaurants and tasty food trucks. 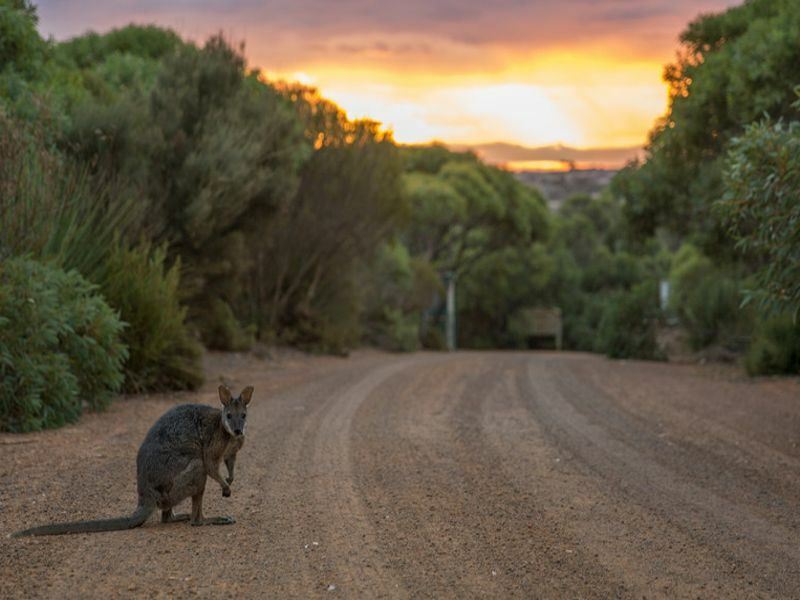 Kangaroo Island, often called Australia’s Galapagos due to its wealth of endemic species, is home not only to kangaroos, but koalas and other animals synonymous with the Land Down Under like gliding marsupials, parrots, dolphins, seals, whales and more. Explore the Remarkable Rocks in Flinders Chase National Park, a cluster of massive, artfully-placed granite boulders that overlook precipitous cliffs and intense blue sea swells. Enjoy swimming in one of the many secluded spots like Stokes Bay and wander through the magical underground world at Kelly Hill Caves. Hanson Bay Sanctuary offers the best chance to see wild Koalas in their natural habitat here where they hang and sleep in the eucalyptus trees.